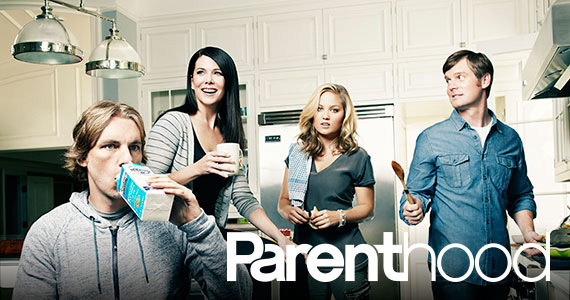 Tomorrow night starts season 4 of Parenthood on NBC. Here’s a recap of what the Bravermans were up to when we last saw them at the end of season 3. The final episode brought us to Crosby and Jasmine’s wedding after a season of them dating other people, struggling with the roles their new partners would play in Jabbar’s life, hooking up with each other, Jasmine house hunting with her boyfriend…and then one crazy raining day in a park, getting back together. Haddie breaks up with Alex (Vince from FNL), Max starts a public school with Jabbar, and they are all adjusting with a newborn in the house. Sara had many emotional ups and downs this season. We finally met Seth, Amber and Drew’s father (hello Aidan from SITC!) and there was a lot of back and forth with him – all while she is still dating Mark the high school teacher. Seth chooses to leave town again and Sarah commits to Mark. There were many moments throughout the season that highlighted the differences in their age and “where they are in life.” So similarly to Richard and Monica on Friends — it all comes down to – do you want kids or are the grown ones I already have enough? It seems like this relationship is over – until Mark shows up at the wedding reception and proposes to her. Amber had her own relationship trials and tribulations including dealing with her father and becoming involved with her boss on a job that Kristina got for her. As assistant to Bob Little, a man running for some sort of local office – Amber at first feels out of her element. But as her relationship grows with Bob, she becomes more confident. The whole situation goes up in flames when Kristina finds out through Haddie that all might not be platonic and goes to the hotel room where Bob and Amber are staying on a business trip. Well that’s embarrassing! Sarah does not agree with Kristina’s judgement or actions in the situation, reminding us of a previous season scenario when Amber slept with Haddie’s boyfriend and the parents stood divided defending their own kids. Drew starts dating his girlfriend this season, and after an awkward yet accurate account of this young high school love, the end up going all the way during the wedding reception. Thanks God no one misses them during the cutting of the cake! Joel and Julia spend the season on an emotional roller coaster trying to have a second baby, and when they find out that cannot happen, trying to adopt a second baby. Julia concocts a crazy agreement with her unwed, pregnant office barista. After letting her move in, taking her to the doctor’s, buying her food, helping her get a better job, etc, etc … the situation ends just like her father, Zeek, warned. Zoe kept her baby. The finale showed the adoption agency dropping off a different child, a seven year old boy, who Julia and Joel welcome into their home. Zeek and Camille are still the patriarch and matriarch of this family. Zeek becomes ill this season, at first, hiding it from the kids, but Crosby does find out. Tune in Tuesday 09/11 at 10pm on NBC to watch the next chapter of this family’s story unfold! Check out my All things Parenthood page here: My Color TV – Parenthood.